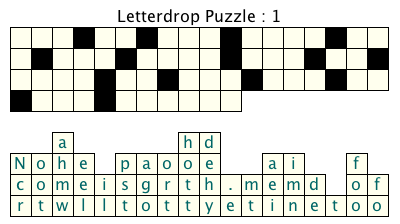 Crossword Express LetterDrop puzzles consist of upper and lower sections which are more or less rectangular in shape. In each column of the puzzle, there are a number of vacant cells in the top section, and a corresponding number of letters in the cells of the lower section. To solve such a puzzle, the solver must place the given letters into the vacant cells in the top section of the puzzle to reveal a message which will normally be a well known literary quotation. Spaces in the quotation appear as black cells in the upper section, and any punctuation characters in the message will already appear in the upper section in their correct locations. 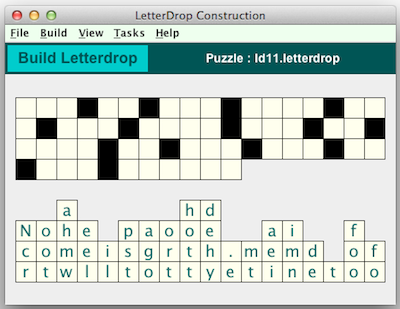 The following graphics show a Letterdrop puzzle in the Crossword Express Build screen and a PNG graphic file produced by the program's print function, showing the complete puzzle. See also a full size version of a PDF file showing the complete puzzle.